Ponder Poetry Cafe Opening Soon! 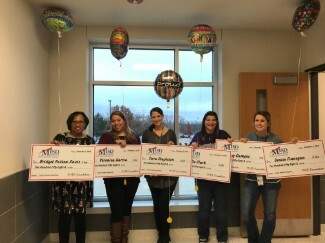 Thanks to the MISD Education Foundation, Ponder teachers recently received funds for a grant written by first-grade teachers Adly Campos, Leslie Clark, Bridget Davis, Denise Finnegan, Veronica Garcia, and Sara Stapleton. The grant will allow first-grade students to host a poetry café to "serve" and share their poetry and reading skills with family and community members. Pictured below: (L-R) Bridget Davis, Veronica Garcia, Sara Stapleton, Leslie Clark, Denise Finnegan.